Howard Wooldridge is back on the road again! 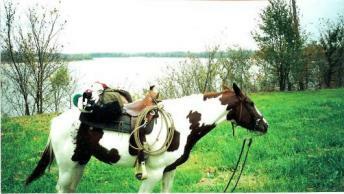 In October and November 2002, Howard and his mare "Misty" rode from Denver, Colorado, to Chattanooga, Tennessee. 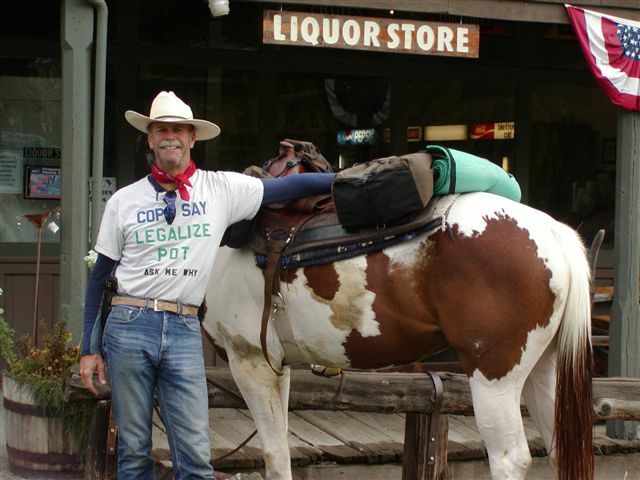 Now he has taken Misty back up to Denver and is riding to the coast of Oregon. The Long Riders' Guild received an email from Howard. "Misty and I made 300 miles the last two weeks in our Denver to Oregon Coast Long Ride. We stopped just short of the Utah border. No real problems to speak of. I did go 24 hours without food when a 'sure thing' rancher turned us away after reading my T-shirt. The challenges lie ahead. I have plotted at least six 50-60 mile segments without towns in Utah, Idaho & Oregon. Still planning a September finish." "We are just outside Salt Lake City, Utah, on a ranch. Today a farrier put new shoes on Misty, trying to correct the horrible job done by the guy in Colorado two weeks ago. All four toes are severely worn off. The farrier believes that she will ride OK but time will tell. We are 800 kilometers into this ride, with about 1,500 kilometers to go. Other than it being boiling hot, dry, and with little food for Misty, etc. all is going well and we expect to finish in early October. It should be noted that we started the trip in 2001 with Misty carrying 20 kilos of pack... she is now carrying 5 kilos." As we say at The Guild: "The more you know, the less you need!" The Long Riders' Guild has had another short email from Howard, with the subject, "I smell salt water!" Howard is as sparing with his words as with the weight he is asking Misty to carry! "After 1126 kilometers/704 sun-baked, shade-less miles Misty and I arrived in the first town in eastern Oregon, Vale. Due to the fantastic, daily help from the people of northern Utah and all of Idaho, Misty arrived sound without any weight loss. Still I am giving her a week off in the shade. Unless the forest fire near Sisters, Oregon becomes worse, we will splash-down in the Pacific about October 4. We are only about 640 kilometers (400 miles) from the finish of our coast to coast ride." The Long Riders' Guild is delighted to report that Howard and Misty have splashed into the surf of the Pacific Ocean at Newport, Oregon. "This final 2000 km (1200 mile) leg was completed in 9 weeks without real difficulty. The expedition from Savannah, Georgia to Oregon was some 5,000 km and took 6 months over 3 years. I wore out 3 pairs of jeans, 2 cowboy hats, 2 pairs of walking boots and 2 stampede strings. Misty did not lose a kilo the last 2000 kilometers. We want to thank the Long Riders Guild for their help and guidance in making this trek successful." Howard and Misty are pictured at the end of their trek. Click here to read about the first part of Howard's journey.